Power trail fever has hit Middle Tennessee! All around the mid state you can drive up and down the hiway and rack up the numbers. I've decided to start my own power trail, however you'll have to work for this one! Barfield Crescent Park has a great trail system in it. All told you can hike 5.9 miles if you do the Marshall Knob, Valley View, Rocky Path, Camping, and Paved Trails. They range from rocky with a 150 foot elevation change up and down to flat and...well..paved! You'll see some amazing limestone formations, sinkholes, 100+ year old rock walls, river, and of course nature. 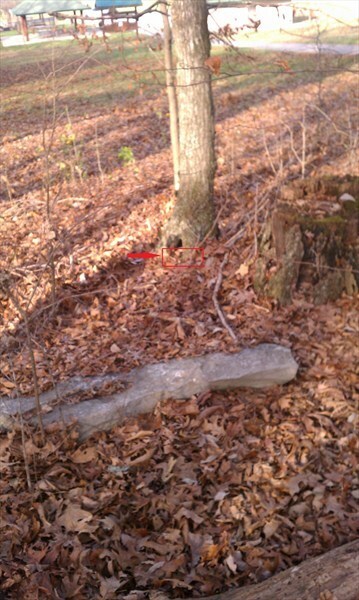 Most caches out here will be immediately off the trail and none will be farther than 5-10 feet. This cache is a pill bottle covered in brown duct tape. Do not look at the spoiler pic unless you don't want to hunt. Paved Trail 6 WARNING!!! SPOILER!!!! !